At first these tokens were made locally from wood, ivory, shell, stone or scrap metal. When an Aboriginal brought his furs to a trading post they would be valued in 'made beavers' and a pile of tokens would be placed on the counter; then as he made his purchases tokens would be withdrawn from the pile until they had all been used. Eventually the Company provided a supply of manufactured metallic tokens to its trading posts. At first these were denominated in 'made beavers' but later, as the First Nations became more commercially sophisticated, the tokens bore denominations in dollars and cents. 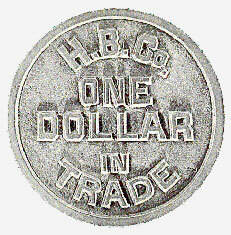 The brass token illustrated was used at trading posts in British Columbia about ninety years ago. It is part of the National Currency Collection, Bank of Canada.